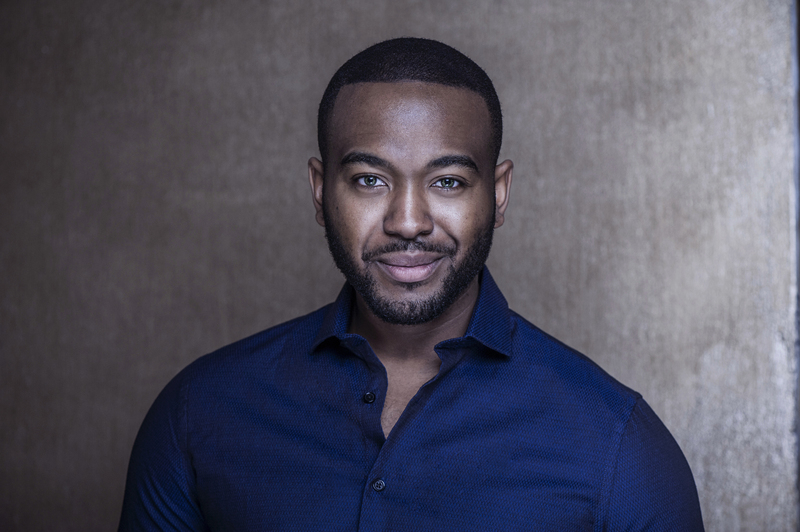 The multi-talented Leighton Alexander Williams also wrote and directed BDB Productions’ Judas Noir, an adaptation of Stephen Adly Guirgis’ play The Last Days of Judas Iscariot. It was his mesmerizing performance as Satan that earned him his first nomination, though, for Outstanding Supporting Performance in a Play. Mixing just enough menace into his portrayal of the charismatic fallen angel, Williams was a delight to watch. He made a lasting impression and stood out even among one of the strongest casts I saw all year. I encountered the magic of Theatre for the first time when I was just 7 years old. I got cast in the Grade 2 musical called A Bug’s Life and I was an army ant that had one line in the entire play. I don’t remember feeling stage fright, or nerves, I don’t think I understood the severity of theatre; all I knew was that we got to sing, dance, and pretend, so count me in. I knew I wanted to be an actor the moment I saw my mother smile in the audience, during my Grade 2 musical. Throughout middle school and most of high school, drama became a hobby and just something I was good at, but didn’t take too seriously. It wasn’t until I met my grade 12 teacher Mrs. Kim Thomas, who taught me that I am tenacious enough to tackle this unapologetic industry. ummmmmmm… that’s pretty difficult! I’ve been fortunate enough to play a handful of 3 dimensional beautifully flawed men. However, I wrote a play called the Adonis Project, that debuted at the Piece of MINE Festival, and I played an anti-hero named Alexander Castle. He’s an incredibly charming surgeon who discovers a treatment that neutralizes race, by dying one’s skin gold. He pitches his new procedure to the government, with hopes of making it mandatory for all civilians and thereby ending racism; but as the play progresses, we learn that he’s a terrorist, and will go at the extremes for equality. I would love to play the sorcerer Quan Chi in my favourite video game series: Mortal Kombat!!!!!!! He would be such a delight to portray! HA! What a mess. How did Judas Noir come about? The Last Days of Judas Iscariot was always one of my favourite plays, since I first saw it in theatre school. Unfortunately, I didn’t get cast in the recent production at Unit 102 in 2015, so I asked my colleagues if they would be interested in putting on our own version of the show. They were all enthusiastic, and very much wanted to be a part of it. 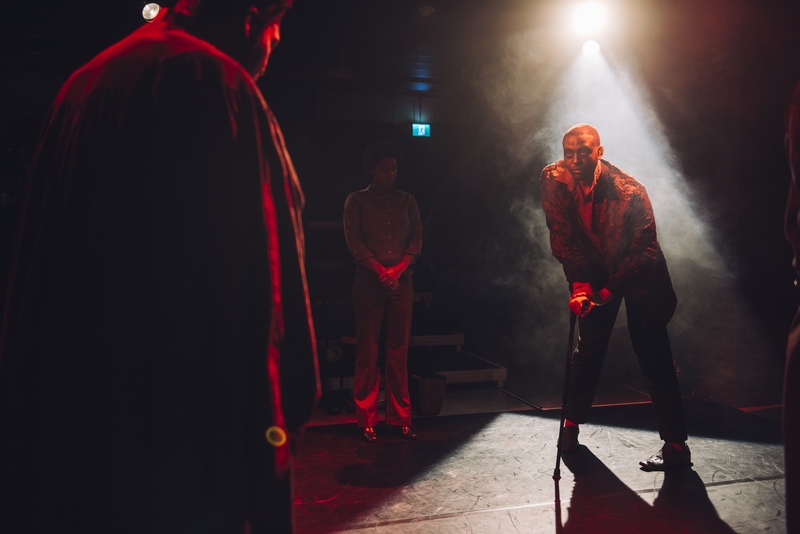 Because it was an all black cast, I wanted to go further and see how that dynamic can influence the text, so I developed a treatment that kept this play extremely current to today’s society. Once I finished my adaptation, I tweeted Stephen Adly Guirgis, and got in contact with him, to get his blessing and a few pointers on how to go about telling my version of his story. How did you approach playing the role of Satan and what sources or ideas did you draw upon for inspiration? My favourite type of characters are the sympathetic villains. I didn’t want to play Satan as solely menacing, as that would do a big disservice to who he actually was. Let’s face it, the devil has a nasty reputation, and many forget that he was the most beloved angel in heaven before his fall from grace. I read Paradise Lost, and watched Al Pacino’s portrayal of Satan in The Devil’s Advocate, to get some outside inspiration. The book really captures his sadness, and Pacino does a marvellous job encompassing his rage; consequently, I was curious to solve the question “why is he so angry?” And I found this quote: “hurt people, hurt people”. Once I realized that I wanted to play a Satan that still has a deep love for God, I found that the resentment, torture, and bitterness all came into place. Correspondingly, his charm made a lot more sense, as it is such a mask. Lastly, I added a physical ailment, and toyed with the idea that Lucifer lost his legs during his fall from heaven. By making Satan disabled, it added a whole new layer to the character, and not just how he moves through the world physically, but emotionally as well. Judas Noir was first produced at Tarragon Extraspace in 2017. What was it like to remount the play at Streetscar Crowsnest as the inaugural Obsidian Darktown production? It was a gift to be given a second chance to tell this story, and to tell it with an insanely larger budget! The biggest difference was that this version of Judas Noir had a larger team, and I felt a greater support as both an actor and director. I also wanted to challenge myself, and the cast to not redo what we did in 2017, but to take it a step further and dare to speak the text from where we are currently. It’s so easy to fall into what is familiar, but I think the magic happens when we break from what’s comfortable. How did you strike a balance between the humour and energy of the play and its more serious themes? My favourite type of art is the type that makes me laugh and cry and feel as many emotions in between. Racial injustice is a heavy subject matter, and I as a Black person would have a hard time sitting through 2.5 hours of dense text (no matter how phenomenal and truthful); It just weighs the soul down. Yes, these stories need to be told, and honoured respectfully, but I believe there are creative ways of getting a political message across, without preaching to an audience. Besides, as a writer, it’s more fun to be sneaky with it. My goal was to lube the audience up with laughter, pop culture, and dancing, and when they’re guard is down; chainsaw them with gravitas of some of these hard hitting themes. Forgive the imagery. But, that’s the type of art I love. One of the most memorable scenes in the play is that amazing dance number. How did that come about? Thank you!! It’s one of my favourite scenes I’ve ever been in as an actor. This sounds very cliche, but it came to me in a dream. I saw Judas drinking his woes away at a bar, and Satan luring him on the dance floor, and by the end of it both men engulfed in total ecstasy. I remember going clubbing quite a bit when I was 22-23, and dancing the stress away. I feel like dance is such an important form of expression that really gets us back to our animalistic nature. It’s such an emotional activity, and because of this, I feel Judas needs to purge after living with his heavy regret. The number was also a great way to break up one of the longest text heavy scenes in the play, and it showcases just how lonely the devil is. He creates this elaborate mirage of what hell is like, but by the end, you can see he’s still hurt that God banished him. I also wanted to blend as many Biblical references as I could with black pop culture and music: Judas being lured to with an apple from the Garden of Eden, Satan as the serpent offering him a bite, to Major Lazer’s “Watch out for This”. Judas hallucinating and seeing Jesus with a crown of thorns flossing to Drake’s “In My Feelings”. It’s such a riot, but it works. What do you hope audiences take away from Judas Noir? Judas Noir entertains the scary notion, that the justice system in the afterlife is as corrupt and flawed as the ones here on Earth. I hope audiences, see the severity of wrongful sentencing. I am currently writing my next short film, scheduled to shoot later this year! Thank you My Entertainment World, for honouring me with this nomination. As artist, we can only hope our work touch as many people as possible, and this is the highest form of recognition. I am humbled, and truly blessed!